One hesitates to write even MORE on the ISIS attack on a Syrian town, Kobani (or Korbane), located on the border with Turkey, but there are a few points worth emphasizing. The town sits on the Turkey/Syria border - quite a new city, beginning in 1912 as a railway station. Before the Syrian civil war erupted nearly three years ago, its population was 44,000 and distributed among Arabs, Kurds, Turkmen, and Armenians. Of interest, it was built by Germany, as part of the Berlin-Baghdad railway. (As the first World War raged, Armenians fleeing vicious fighting in eastern Turkey found shelter here - setting up a fascinating sidetrip into the raging controversy about an Armenian genocide by Turkey of old.) In 2012, as Syria was disintegrating,Syrian Kurds took control of the city as a base from which to fight against President Assad, as well as fend off the more extreme of the Islamist groups. Today, of course, the whole world is aware that the town is under siege by ISIS forces, who have already overrun the many villages around the region. 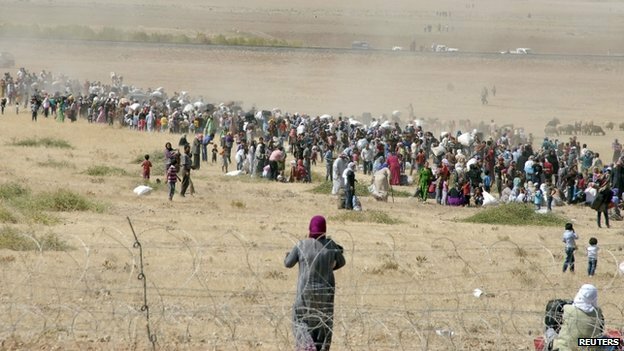 The result, so far, is 400,000+ residents of the region are now on the move (internally displaced refugees), with 100,000+ of that number having fled across the border into Turkey. If one just accepts the main thrust of Western coverage of this situation, we will be pulling our hair out, asking why our Western ally Turkey - a NATO member, and EU candidate - isn't leaping to the defense of the mainly Kurdish fighters in the city defending it against the ISIS advance. Subsequently, we are exasperated and bewildered by Turkey's lack of response. And we've been treated again and again to three major types of images: Refugees watching their city falling slow motion to the fanatical ISIS, a rather lethargic line of U.S. jets merely pestering ISIS with a take-out of a vehicle here and there, and finally, a row of Turkish tanks squatting on the same hillside awaiting further orders. 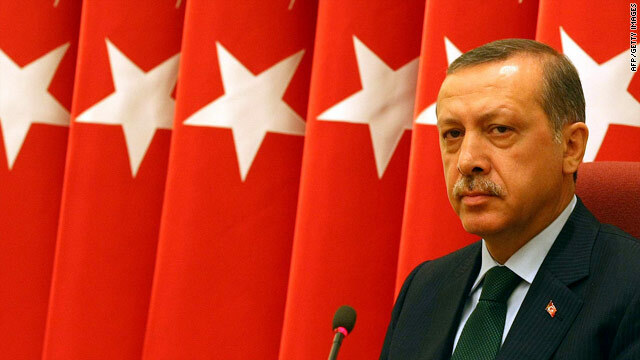 Simply put, Turkey's President Recep Tayyip Erdoğan doesn't view ISIS as his most immediate threat. Rather, he views Turkey's Kurdish population as potentially a bigger concern, most likely to his own power. Turkey President Erdogan, walking a tightrope between the Syrian conflict (he wants Assad out); ISIS (he wants Western allies to handle it), and the defense of Kobani (he's not in a hurry to help the PKK Kurds). Turkey's current boundaries, as so many others in the Middle East, are arbitrary, and in this country's case, include a broad swath of ethnic Kurd lands. Their inclusion in Turkey for nearly 100 years (based in the agreements after World War 1) has long been a struggle. Wikipedia puts it thus, "During the 1970s, the [Kurdish] separatist movement coalesced into the Marxist–Leninist Kurdistan Workers' Party (PKK), which has since been listed as a terrorist organization by Turkey and a number of allied states and organizations around the world, including the United States, NATO, and the European Union. From 1984 to 1999, the Turkish military was embroiled in a conflict with the PKK." With the capture of the PPK leader, Abdullah Öcalan in 1999, the violence has since then tapered off, with desultory efforts by the government to unite the country in various manners. Kobani, Syria - a Kurdish city located right on the border with Turkey. Go south from the "Y" in Turkey, heading to the "R" in Syria, and the town is right where that little bump is in the border. It is being defended by Kurds primarily aligned with the PKK. But one must admit that in spite of almost breathless Western concern for the city and its population, most of the residents have long fled, and the city isn't an ancient one. From a Voice of America article, "Kobani was a test case for Kurdish autonomy, said Professor Ibrahim Sirkeci of Regents University in London. “They set up communes there. So it was kind of a little self-rule case study,” said Sirkeci. ... Kurds in Turkey have reacted angrily to Ankara’s stance and accuse the government of supporting the Islamic State. Riots in several cities have killed scores of people. Kurdish separatists known as the PKK fought a decades-long war against the Turkish state, until peace talks began last year. Professor Sirkeci said Ankara is wary of strengthening the Kurds. “If you support PKK or fight against ISIS today in northern Syria, that will mean directly strengthening the PKK, and making it a stronger party in the negotiations, particularly within Turkey as part of the peace process,” he said. He said allowing the fall of Kobani would backfire on Turkey. “I think in the long run it’s a disastrous policy simply because there are two other Kurdish cantons [in Syria], much larger with much better defenses, which won’t be taken. And are those going to be friendly to Turkey in the future? Absolutely not,” said Stephens." The PKK has labeled its forces People's Protection Units (YPG) while the Kurdish fighters in Iraq are called Peshmerga. Kurds across the two lands - the autonomous Kurd region in Iraq, and the eastern portion of Turkey - both freely utilize women as fighters and support personnel (similar to Israel). For women fighters or for men, there is no mercy shown to any captured by ISIS. * The Kurds of Turkey (and apparently those in Northern Syria) are NOT those of the Kurdish lands of Iraq. * Erdogan has already angered Turkish Kurds by preventing a flow of Kurdish fighters wanting to cross back into Syria to defend Kobani, as well as controlling the extent of arms and ammunition heading to the Kurds in the besieged town. * Though Turkey has provided safe haven for hundreds of thousands of Syrian refugees, including Syrian Kurds, Erdogan has now sent the message to the Kurds of Turkey that the Kurds of Syria are NOT worth Turkish blood. * Thus he risks a general re-alienation of the eastern portion of his country negating prior efforts to integrate Kurds into the mainstream of Turkish society. * Kobani may yet be lost to ISIS, a massacre of the remaining population in the city may or may not happen. Journalists report that several hundred elderly remain trapped in the city, but solid numbers and facts are hard to come by. * The fate of Kobani is hardly the end of the conflict with ISIS, but it may represent the beginning of a much bigger internal problem for Turkey.